At least 18 people died and 160 were injured when a train derailed in northeastern Taiwan on Sunday, Reuters reported with the reference to authorities. Several carriages were overturned in the crash, which occurred in Yilan County near the coast on a line popular among tourists. The government said the train had been carrying 366 people, and the Central News Agency said more than 30 were still trapped on board. Footage on local TV showed rescuers and dozens of military personnel working through the wreckage on Sunday night in search of survivors, with ambulances stationed nearby. The toll at 7:45 pm was 18 dead and 160 injured, the fire department said in a statement. An investigation was under way to find out the cause of the accident, Taiwan Railways Administration said. “The train was in pretty good condition,” its Deputy Chief Lu Chieh-Shen told a news conference. The authority was also checking to see if any foreigners were on board. A train derailed on Sunday in Taiwan; at least 17 passengers were reportedly killed and 20 injured, Sputnik reported citing Huantsu Shibao. 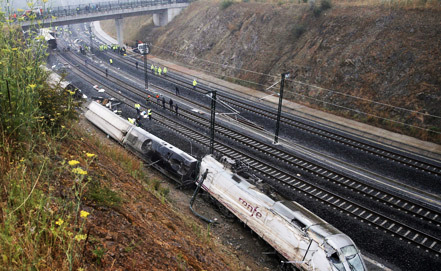 The incident occurred at 4:50 p.m. local time; the cause of the derailment has yet to be clarified. According to the published photos showing the site where the incident took place, at least six carriages derailed and capsized. The emergency service has arrived at the site; the injured are now being treated by medical personnel.